Upgrade your efficiency. This new furnace extracts nearly all the heat from its fuel, making it extremely efficient to run. No homeowner wants to deal with furnace problems, especially if your system doesn't work or is very inefficient. At Precision Air, we specialize in furnace replacement and furnace installation, and we can help you keep your home comfortable all winter long. If you have a damaged or non-functioning furnace, we can help you get a fast replacement that fits your needs. For homeowners looking to upgrade over an old, inefficient furnace, our experts can recommend energy efficient systems that use a variety of fuel sources. Give us a call today at 1-844-386-0719 or contact us online to get a free estimate on furnace installation and our other HVAC services. We offer all our work in Nashville, Franklin, Murfreesboro and the nearby areas in Tennessee. Many homeowners ask: "Why should I replace my furnace if it's working?" That's a good question. The trouble with an older furnace is that even in peak condition, it may only be working at 75% efficiency. In other words, 25% of the fuel you're paying for is wasted, because it's not being converted to heat for your living space. The experts at Precision Air can provide you with a furnace and HVAC inspection and recommend the right solutions for your home. We offer a variety of types of furnaces, allowing you to choose the right fit for your needs and budget. Upgrading your furnace will save you money on your utility costs while making your home more comfortable. Fuel type: Natural gas, propane & oil are the most common furnace fuels, but wood and pellet-burning furnaces are also available. Multi-fuel furnaces can typically burn two types of fuel. Furnace size: Furnace size is usually given in BTU output, a measure of heating capacity. Our furnace experts can help you determine what your home needs. Efficiency: Annual Fuel Utilization Efficiency (AFUE) denotes furnace efficiency. A 10-year-old furnace will probably operate below 80% AFUE. New high-efficiency furnaces can operate at 95% AFUE or higher. Modern units: A sealed combustion furnace, also known as a high-efficiency furnace, requires no chimney and no indoor air for combustion. Instead, outside air is brought in through a small pipe to provide oxygen for combustion. A small fan blows flue gases outside through a plastic pipe. A sealed combustion furnace is more suitable for a tight, well-insulated house. If your furnace is broken, outdated, or inefficient, we can install a replacement furnace in your home. We offer a wide range of energy efficient options that will keep your home comfortable while reducing your utility costs. Call us today at 1-844-386-0719 or contact us online to get started with a free estimate on furnace installation or any of our other heating services. 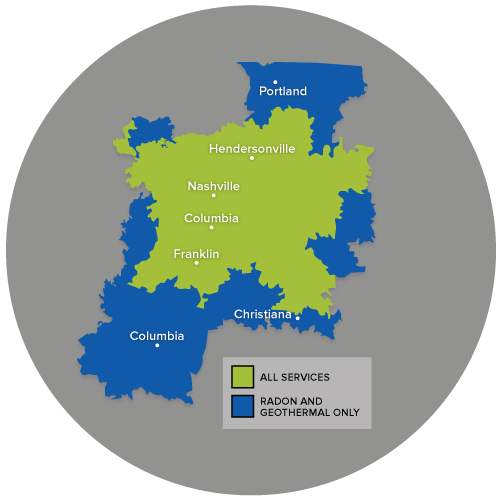 We proudly serve in Nashville, Franklin, Murfreesboro, Antioch, Hendersonville, Brentwood, Smyrna, Lascassas, Madison, Hermitage and throughout the surrounding areas.